Zephyr 1/4'' slotted hex shank insert bit. 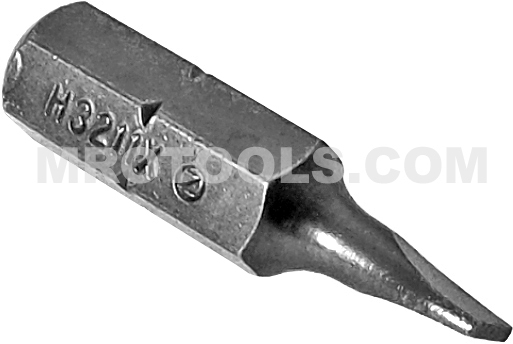 These slotted screwdriver bits are industrial or self tapping screw bits, with extra hardness. Slotted screwdriver bits have a single slot in the fastener head and the tool used to drive a slot is called a slot-head, flat-tip, or flat head. Zephyr Tools is a worldwide leader in fastener tooling products. Zephyr brand screwdriver bits are MADE IN THE USA, but can be found throughout Asia including Bangladesh, Cambodia, China, Hong Kong, India, Indonesia, Japan, Korea, Laos, Malaysia, Philippines, Singapore, Taiwan, Thailand and Vietnam. The H3211X Zephyr 1/4'' Slotted Insert Bits, For Self Tapping Screws is one of thousands of quality tooling products available from MRO Tools. Please browse Zephyr Slotted Insert Bits for tools similar to the H3211X Zephyr 1/4'' Slotted Insert Bits, For Self Tapping Screws. H3211X Zephyr 1/4'' Slotted Insert Bits, For Self Tapping Screws description summary: Zephyr 1/4'' slotted hex shank insert bit. These slotted screwdriver bits are industrial or self tapping screw bits, with extra hardness. Screw Size: 4F-5R Blade Thickness: .034'' Blade Width: .170'' Overall Length: 1'' Quantity discounts may be available for the H3211X Zephyr 1/4'' Slotted Insert Bits, For Self Tapping Screws. Please contact MRO Tools for details.